If you like exploring, then you need to know about Urban Hike. This is a group of volunteers who plan out a fascinating route around a different neighborhood, town or borough. IheartPGH has participated in many of the past Urban Hikes. It was a stop at this church on the Sharpsburg Urban Hike that first got me thinking about church reuse. Earlier this Summer, I was inspired to write about the John Woods House (aka the oldest house in Pittsburgh) after sharing an Instagram photo I took during the Hazelwood Urban Hike. Glen’s Frozen Custard – this is one of those places you NEED to know about. 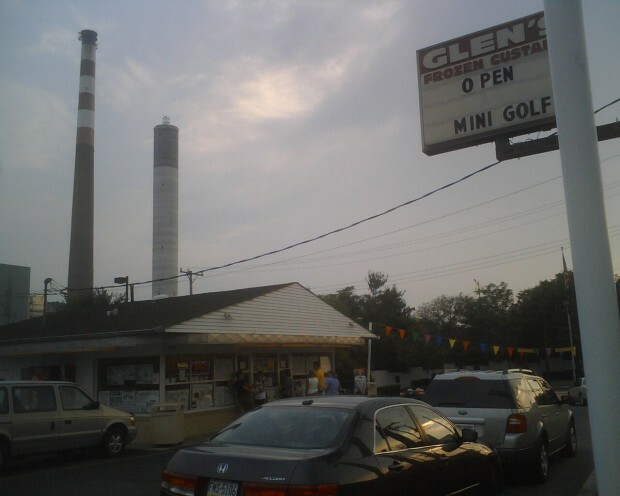 Glens is an establishment and worth the drive. When I was a kid, we would pile into the family station wagon for a drive out to Glens – I have vivid memories of riding backwards in the way-back seats of our Chevrolet station wagon as we crossed the Highland Park bridge. Many people who live in the East End often claim that if they have to cross a bridge to get there, then the destination is not worth the trip. Glens is one of those destinations that is worth crossing the bridge for. Rachel Carson Homestead – Rachel Carson is a Pittsburgher whose name you might know because the bridge next to the Andy Warhol Bridge and the Clement Bridge is named after her. She is also the author of the 1962 book Silent Spring about pollution in our environment. Check out our recent blog post on Rachel Carson’s other house here. The Urban Hike folks have planned a short hike (short means the hike will be over before the Steeler game starts) for Sunday morning. Lucky for you, the hike starts at Glens which has not yet closed for the season and will likely be serving pumpkin frozen custard. Yes, PUMPKIN custard! Follow @UrbanHikePGH on Twitter for updates.